To order any of the items below, click on the price of the item. This will open up an email form for you to send with your request. If you do not want the whole set, you may buy individual discs at $20.00 each which includes S&H. You will receive a return email with shipping and payment options. 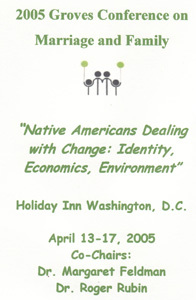 "NATIVE AMERICANS DEALING WITH CHANGE: IDENTITY, ECONOMICS, ENVIRONMENT"
1) "Health Disparities" by Audrey Koertvelyessy and Hamilton McCubbin. 2) Creating Indigenous Student Exchanges" by J. Anne Calhoun. 3) "Indian Tribes, the Environment, and Federal Law" by Larry Roberts, J.D. 4) "A Brief History of Indian Lands Viewed as a Paradigm for 200 Years of Federal Indian Policy" by Heather Sibbison, J.D. 6) "Context & Meaning of Family Strengthening in Indian America" by Julie Wilson. 8) "Updating Past Groves Conferences" by Fischer, Settles, Macklin & Ackerman, Lasswell, Macklin, Steele, Koepke. 1) "Mexican Americans: The Who, What, Where, & When" by Yvonne Caldera. 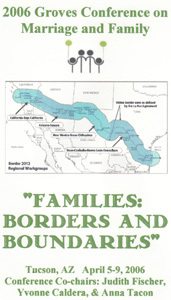 2) "Parenting Across Borders: Transnational Casework and Family Survival" by Leah Schmalzbauer. 4) "Effects of an Immigration Raid on Families" by Mary Romero. 6) "Cutting Edge Issues Affecting Latino Families" by Arditti, Cobass, Russell & Wilkinson-Lee, Sarksian, and Cardona. 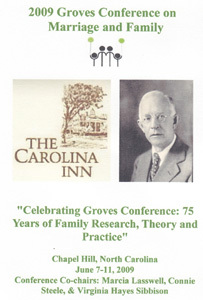 "CELEBRATING GROVES CONFERENCE: 75 YEARS OF FAMILY RESEARCH, THEORY AND PRACTICE"
2) "Greetings,The Legacy of Ernest Groves, and In Praise of 50 years" several different speakers. 3) "The Groves Family Tree: What does it mean to be a Groves member?" 4) "The Groves Family Tree: What does it mean to be a Groves member?" cont. 5) "Dedication to Marvin Sussman"
Figley Panel--The Multidisciplinary of family theory: Thesis & Antithesis. 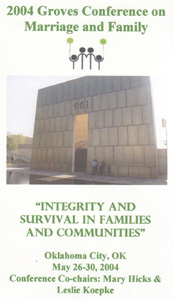 Loss, & Resilience: Family Therapy Interventions; and, Darling Panel--why Family Life Education? Programs for a Day, a Year, a Lifetime; and, Arms Panel--Intergenerational Relations. 14) "Research, Theory, Policies, Practices--past/present/future" Macklin Panel--Aging Is a Family Financial Affair.